Because I was once in a PhD program and have retained many of the associated interests, standards and personal traits, well-intentioned, but I believe misguided, friends have always suggested that what I absolutely need more than anything is a girlfriend with a PhD [or MD, LLD or MBA, etc.] —you know, for “intellectual stimulation” and values alignment. Yes, it’s easy to imagine that being paired off with someone who is not only warm and “hot”, but also bright completes the perfect moment: snuggling on a [faux] bear skin in front of a bright, warm and—if you get close enough—hot fireplace with someone just like that. But then, it is possible to get burned by both. The challenge—in recruiting and relationships alike—is to find somebody like that fireplace, but without getting scorched, singed or burned out. Recruiting, despite having somewhat different, indeed cooler, businesslike priorities, nonetheless seems to endorse the same idealized fireplace trinity: the perfect candidate will be warm with colleagues, clients and customers; hot about and for the job, i.e., passionate about doing it well and long; and, of course, bright—in two senses. First the job candidate or employee will “light up a room”—just as a fireplace does when we enter its space. Not merely attention-grabbing, but also engaging, even maybe spellbinding. PhDs at their best are supposed to be and are like that. Second, the candidate or employee should be bright in the intellectual sense—quick as fireplace flame, able to ignite ideas and people, catch on the first time and otherwise be just plain smart. Again, PhDs at their best will be like that. That job candidate or employee—again like the perfect fireplace—will also project warmth simultaneously or shortly after we notice how bright [s]he is. Finally, there is the passion that is mentioned in recruiting articles only a little less frequently than in Harlequin romances. Alas, my experience has taught me that intellectual interactions with PhDs, like those with fireplaces and romantic partners, can get out of control, get too heated too handle and prematurely burn themselves out. Average life experience should be sufficient for an understanding of why relationships that were bright, warm, hot and so full of promise go cold—almost always after simple burn-out or uncontrolled conflagration, e.g., heated confrontations. But average life experience doesn’t so frequently include interactions with, lessons learned from and management of people with PhDs. Hence, the need for some guidance—starting with a bit of “Simon says”. Simon H., PhD, a long-time friend and colleague, who has requested anonymity, estimates that, based on his IT experience at a Fortune 500 hi-tech giant and in university teaching, the ratio of socially aggressive-defensive PhDs to unguarded ones is about 10 to 1. As he sees it, schools tend to select for precisely the aggressive-defensive-competitive traits required to succeed in a PhD oral defense, law school, MBA program and med school. So, what can you expect in an encounter with this type of PhD? 1. You have PhDs in the same field: In my experience, more often than not, this is a predictor of turf wars—especially in disciplines that professionally and in practice do not require, invite or tolerate much or any teamwork at all, e.g., the humanities, such as philosophy or literature, in contrast to, say, much of medicine, which allows for either solo and/or team excellence, or, even better, engineering—which is virtually impossible to apply without massive collaboration with others, save for the likes of eccentric DIY garage-based inventors. This difference can be illustrated in a comparison of the highest ranks of political leadership. Interestingly, our highly competitive, individualistic North American culture favors political leaders who, when possessed of advanced degrees, tend to concentrate in adversarial, confrontational individualistic specialties such as law. This is in striking contrast to the collaborative “harmony”-oriented engineering and technology credentials of the sort possessed by China’s collectivist ruling committee, whose nine members appointed in 2007 were all engineers selected to preserve and inspire “collective harmony”, rather than allow undue influence of any single individual, e.g., a cult leader. The last U.S. scientist-president was Jimmy Carter, who, despite his high intelligence and engineering-scientific mind set, was, although not out of his depth, unfortunately swimming in waters more suited to maneuvering sharks and agile lawyers. Perhaps this is one reason why the U.S. Congress is chronically deadlocked, while the Chinese seem much less so. [Of course, another is the peril of open opposition within a tightly controlled State apparatus like theirs]. 168 Representatives and 57 Senators had a law degree. Of these, five (three Representative and two Senators) also hold a Master of Laws (LL.M.) degree. That’s 42% of the 535-member Congressional total—plenty of bricks for stonewall deadlock and gridlock. 83 Representatives and 16 Senators earned a master’s degree – often a Master of Business Administration (M.B.A.)— as their highest educational degree. 27 Representatives and one Senator have no educational degree beyond a high school diploma. 23 Representatives (but no Senators) have a PhD. 17 Representatives and three Senators have a medical degree (this number includes one Senator with a veterinary medicine degree and one Representative with a dental degree). 5 Representatives (but no Senators) have an associate’s degree as their highest degree. One House Member has a licensed practical nurse (L.P.N.) degree. Having been in philosophy PhD programs at Duke University and at the University of Western Ontario, while teaching at the latter, I was, of course, in what is arguably the most argumentative discipline that exists, forgivably perceived by everybody else to have the objective of proving very little, except that even if I’m not right, you’re wrong and that’s the way it should be—especially if I have a PhD. But this kind of competitiveness is not limited to philosophy PhDs. “Yes, but…..” or straight-out “No, no, no!” is the hallmark of any interactions between global warming science PhDs and climate skeptics that funnily always seem to flame [out] like strange fireplaces with all heat, little light and zero warmth. So, if you dealing with a candidate, colleague or anyone that combative or defensive who is also a PhD in your own PhD-credentialed or even merely other-degreed field, take care not to tread on his or her toes or turf, lest you trigger a fusillade of “no!”s or the more polite and sedate “yes, but”s and risk creating antagonism and rivalrous resentments. What makes this outcome quite likely is that—and here I’m applying some of what I learned in philosophy departments and real life—if both of you have comparable degrees in the same field, any gaps in the other’s background can be most easily exposed by you. Not wanting to risk this, a defensive candidate, colleague, etc., will not welcome “collegial” questions and discussions of field-related matters, however well-intentioned. The most important exception to this likely bad outcome is the case in which you, at the outset, explicitly identify yourself as less knowledgeable and therefore deferential and non-threatening. Even so, that can raise the stakes, if not increase the risks, because there is always the possibility of the defense being upstaged or caught short by a comparative neophyte, i.e., you. Hence, in interviewing and in social relationships, faith in the over-rated, exception-riddled maxim “likes attract likes” can easily cause a disaster—e.g., between two people who are alike in both wanting to be “number 1” or, more or less equivalently, two lawyers. So, don’t assume that your having or, more to the point, displaying credentials similar to the candidate you are interviewing necessarily bodes well for the outcome. How should you handle a PhD-to-PhD interaction when you are not sure? Do what almost virtually all the PhDs I’ve ever known do when they interact with their degree peers: Keep it light and non-threatening, e.g., talk about how the cheese goes so well with the French crackers or how hard it is to keep a pool filter unclogged. 2. You do not have a PhD in the same field: If an interviewer or social/romantic partner does not have a similar PhD, you might imagine that competitive conflict and turf wars would be much less likely. Actually, no. They can and do become even more intense, despite any appearance of not being armored up for the same joust. The way it happens is simple to explain: If only one of you has a PhD in anything, innocent curiosity and interest of the other[s] may be seen as potentially threatening and embarrassing—and avoided/evaded, especially since the curious tend to learn exotica and little-known factoids about the things they are interested in. This is a scenario I have seen play out time and time again, e.g., when I attempt to discuss medicine, psychology, economics, mathematics, biology, sociology, anthropology, physics or law with PhDs in these areas. In my experience, the two most common conversation-killers with heavily-degreed people have been interactions that either challenge the validity of their inculcated sacred paradigms or their grasp of them. Two more conversationally fatal missteps are making their hard-to-acquire esoteric expertise seem much less so or daring to encroach on it without having “paid your dues”. 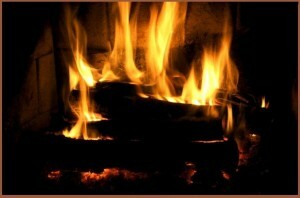 Given these hazards and the opportunity to share a fireplace or an interview with someone who is very bright, I would hope that we could do much better than just 1 out of the 3 of the fireplace trinity and at least 2 out of the 4—if we count and include, in addition to warmth and heat, both ways to be bright.